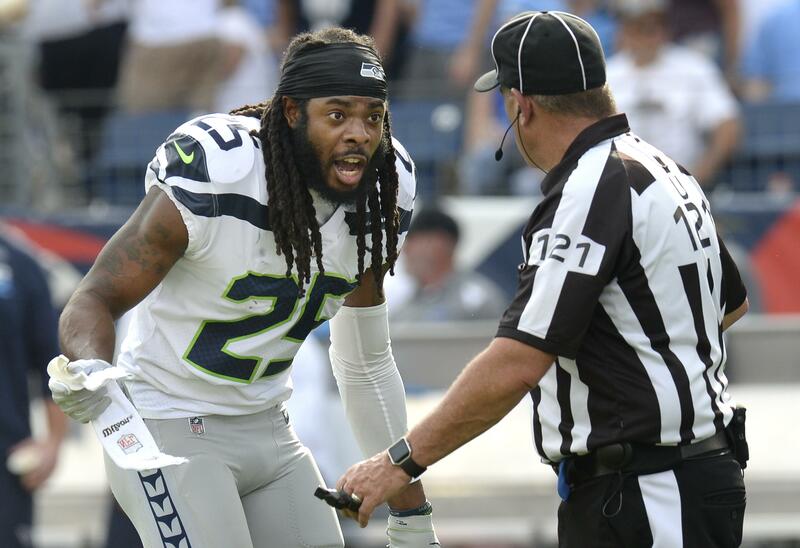 UPDATED: Fri., March 9, 2018, 4:45 p.m.
SEATTLE – The Seahawks officially released cornerback Richard Sherman Friday morning, a move that had been rumored for two days and will for now end the Seattle career of one of the team’s most iconic players. Sherman becomes a free agent and the team has let Sherman know it would be interested in re-signing him at a salary lower than the $11 million he had been scheduled to make in the final year of his contract in 2018. But Sherman is also expected to explore the free-agent market and he may well have played his last game with the Seahawks. The Seahawks also reportedly released cornerback Jeremy Lane, according to ESPN, another move that had been long rumored. The release of Lane saves Seattle $4.75 million against the cap in 2018 assuming it is not made with a post-June 1 designation. The team had yet to officially announce the moves on Friday morning. The Seahawks explored trade options for Sherman, but nothing materialized with Seattle instead deciding to release Sherman on Friday ahead of the beginning of the new league year on Wednesday. Making the move now allows Sherman, who is acting as his own agent, a head start on finding a new team ahead of the beginning of the new league year, when players whose contracts run out will officially become free agents. Sherman, taken in the fifth round out of Stanford in 2011, became a starter six games into his rookie season and was rarely off the field for the Seahawks until suffering a torn Achilles tendon against Arizona on Nov. 9, teaming with free safety Earl Thomas and strong safety Kam Chancellor to form the core of a secondary that would soon become known as the Legion of Boom and within two years helped lead the Seahawks to their only Super Bowl. He ranks fourth in team history in interceptions with 32 behind only Dave Brown (50), Eugene Robinson (42) and John Harris (41). Sherman said last month at the Seattle Sports Star awards that he hoped to negotiate a new deal with the Seahawks but said he was fine with the idea that he might have to move on. “I plan on playing five or six more years, whether it’s here or elsewhere,” Sherman said. Sherman had surgery to repair his right Achilles in November. He then had a separate surgery to clean bone spurs out of his left Achilles last month. Sherman said at the Seattle Sports Star awards he thought he would be ready for the beginning of minicamp. “I guess I’m more ahead of schedule than they thought I was,” Sherman said then of his progress in recovering from Achilles surgery. The releases of Sherman and Lane leave Seattle’s cornerback spot with some uncertainty heading into free agency. Shaquill Griffin will return as the starter at right cornerback and the team is expected to tender restricted free agent Justin Coleman to return as the nickel corner. Coleman replaced Lane at the nickel corner spot early in 2017 and Seattle initially included Lane in a trade to Houston for left tackle Duane Brown before Lane failed a physical and returned to the Seahawks. Seattle also could re-sign Byron Maxwell, who returned to the Seahawks in November following Sherman’s season-ending injury and started the rest of the way at left cornerback. The Seahawks could also re-sign DeShawn Shead, who like Maxwell is also an unrestricted free agent. Neiko Thorpe is also under contract for the 2018 season (although there has been some speculation he could also be a salary cap casualty). Also on the roster are DeAndre Elliott, who saw some action as a rookie in 2016 before spending all of last year on injured reserve, and Mike Tyson, a sixth-round pick in 2017 who spent most of last year on the practice squad. Published: March 9, 2018, 10:20 a.m. Updated: March 9, 2018, 4:45 p.m.